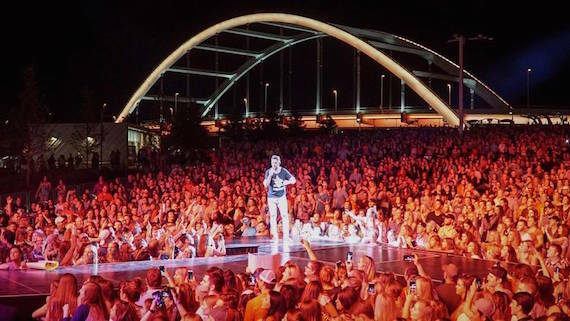 Leading into the first of two hometown, headlining shows on his 2017 Home Team Tour at Nashville’s Ascend Amphitheater on Thursday (April 20), Thomas Rhett stacked the deck, charming the crowd chart-topping songs, surprise collaborations, and even a cover tune or two. Equipped with the songs and style that make him an artist with some of the highest crossover potential, Rhett had the crowd on their feet and dancing with hits and album tracks including “Make Me Wanna,” “Get Me Some of That,” “T-Shirt,” “Vacation,” and “Shake Your South Side.” Mid-show, on a satellite stage, Rhett offered his earliest hits, including “Something To Do With My Hands,” and “Beer With Jesus,” which the star penned in a dorm room at Lipscomb University. The talented songwriter was able to fill his set with not only his own hits, but a string of those he penned for other artists, including Florida Georgia Line (“Round Here”) Lee Brice (“Parking Lot Party”) and Michael Ray (“Think A Little Less”). Meanwhile, background video offered glimpses of Rhett’s childhood, from sharpening his craft of songwriting at age 8 to a teen thrashing at a drum set. Thomas Rhett’s six-week No. 1 song and current CMA Single of the Year “Die A Happy Man” was infused with an extra shade of soulfulness, complete with saxophone. Later in the evening, the crowd learned that Rhett can still pound the skins, as he and drummer Chris Kimmerer took turns showing off their skillful rhythms. It may have been Rhett’s hometown headlining show, but he shared his stage time generously. Thomas Rhett welcomed a plethora of special guests. Grammy winner Maren Morris joined him for the new single, “Craving You,” while Danielle Bradbery joined for “Playing With Fire,” a track Jordin Sparks collaborated on for his Tangled Up album. Dierks Bentley, who had previously been up the road at Bridgestone Arena celebrating the Nashville Predators’ Game 4 win over the Chicago Blackhawks, joined Thomas Rhett for “Somewhere On A Beach,” which they performed on a satellite stage in the middle of the outdoor venue, to the delight of fans with lawn seating. When she is not on the road, Ballerini has been putting the finishing touches on her sophomore album for Black River Entertainment. She used the show in Nashville to showcase a new track, “Beautiful For A Moment,” a reverie rich in images of Valentine’s Day, roses, and leather jackets. Despite Ballerini’s youth, she is a seasoned performer, commanding the stage with a confident yet accessible charisma. She often knelt on the stage to shake hands and interact with fans in the front rows. “I’m the biggest fan girl and grew up going to concerts,” she said, adding how much she wanted to share a “guitar moment” with the Nashville crowd. She opted to go barefoot for her closing song, and her first No.1 hit, “Love Me Like You Mean It,” before skipping offstage. Recent RCA Nashville signee Ryan Hurd also showcased a casual effervescence onstage before Ballerini, as he offered several of the tracks he has released over the past few months, including “We Do Us,” and “Love In A Bar.” Hurd proved his music can move into full-fledged rock territory on “City Girl,” as two guitarists offered crunchy guitar chords and even a solo “duel” during the performance. “This song changed my life because I wrote it about the beautiful woman who changed my life,” Dickerson said in introducing the track. This generation of country artists have grown up sampling the choice fruits from all styles of music, and those influences showed as each paid homage to current and classic hits. Dickerson injected Whitney Houston’s “I Wanna Dance With Somebody” into his own original “MGNO.” Ballerini offered the aforementioned tune from The Chainsmokers while Thomas Rhett brought all the openers back to the stage with Bruno Mars’ “24K Magic.” The song made for an appropriate closer as fireworks painted the evening sky in a rainbow of colors, further lending a magical feel to the evening. 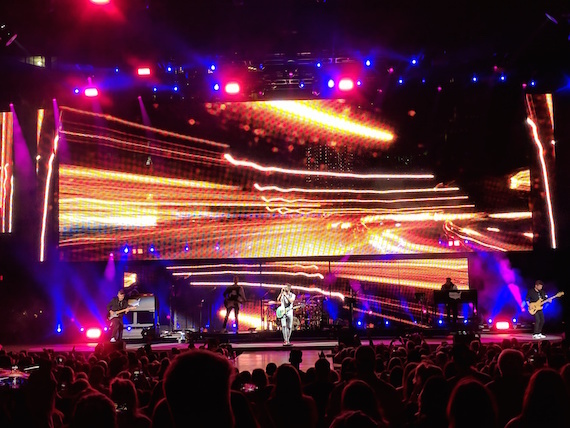 Thomas Rhett brings another headlining show on his Home Team Tour tonight (April 21) at Ascend Amphitheater.